The Best Hot Dogs. Ever. If you've been craving for a franchise opportunity that is unique, distinctive, and every bit as delicious as it looks, your search is finally over. Umai Savory Hot Dogs™ not only offers unique fusion-style gourmet hot dogs, sausages and sliders, but our create-your-own menu offers unlimited combinations and customization for even the most die-hard fans. 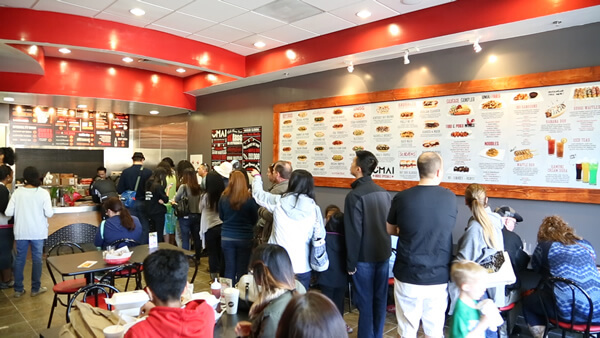 With over 27 signature flavors, 11 types of meat, 20 types of sauces, 8 types of fries (and many more), Umai Savory Hot Dogs™ certainly has something for everyone – and all made fresh to order. Our healthy hot dogs are made with premium cuts of meat, have all natural casings, are gluten free, naturally smoked, contains no MSG, no by-products, no fillers, and no artificial flavors or colors. Our specialty items includes the famous waffle dog, fried banana dog, Poku Wings, Tori Wings, inu rangoons, garlic noodles and many more! We've grown considerably since our humble beginnings. Yet, we remain committed to our food quality and customer service, delivering the highest quality, always. Just taste our food and listen to our fans. 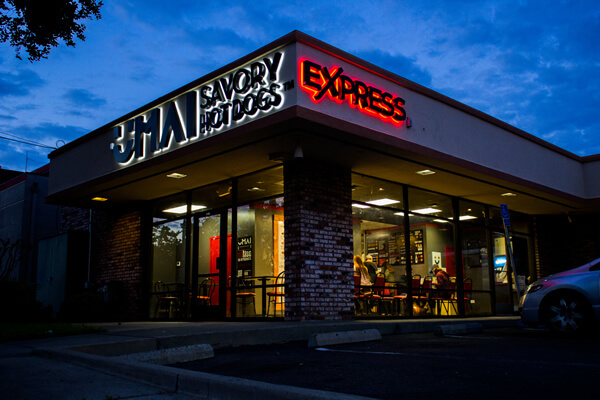 Starting from just a single hot dog cart in 1992, Umai Savory Hot Dogs™ has built a solid following over the years thanks to our dear customers and fans. 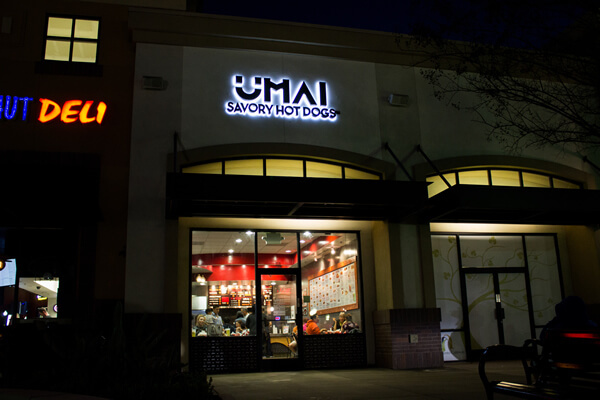 Umai Savory Hot Dogs™ is a fast-casual restaurant serving up fusion gourmet hot dogs, sausages, sliders and many specialty items. 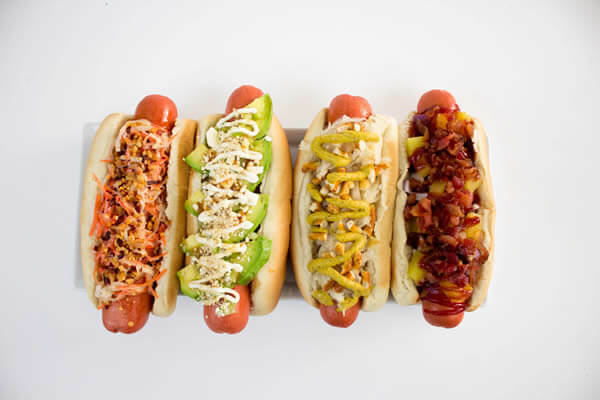 All of our hot dogs are made with fresh cuts of premium meats, all natural casings, all fresh ingredients, are gluten free, naturally smoked, contains no MSG, no byproducts, no fillers, and no artificial flavors or colors. Our buns are baked daily and our fresh ingredients are sourced from local farms and dairies. All orders are made to order with a fully customized menu with a wide variety of buns, hot dogs, sausages, toppings, and specialty sauces. Our unique side dishes, appetizers, desserts, specialty iced teas and craft beers will offer a taste you will never forget. Americans love hot dogs - more than any other country. Through sporting events, local picnics, carnivals, festivals and restaurants, Americans consume over 20 billion hot dogs a year. According to recent survey data obtained by the American Hot Dog and Sausage Council, Americans purchase 350 million pounds of hot dogs at retail stores - that's 9 billion hot dogs! That works out to about 70 hot dogs per person each year. 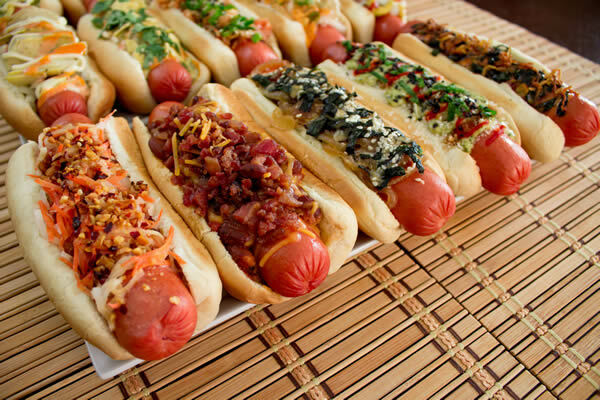 Hot dogs are served in 95 percent of homes in the United States. 45% of hot dogs are consumed at the retail level, 15% are purchased from street vendors, 10% are consumed through festivals and events and 9% are purchased at ballparks. The remaining 21% are consumed through restaurants. There are currently only a total of 6 hot dog restaurant franchises in the United States, serving a population of 318.9 million. Of those 6, only 2 have national presence. 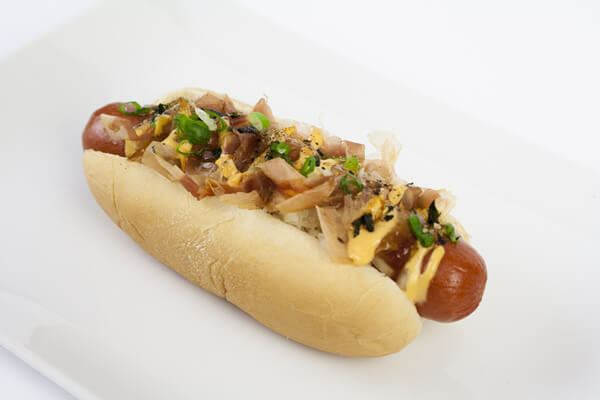 So what really sets Umai Savory Hot Dogs™ apart? Other than our huge variety of 8+ types of hot dogs, 6 types of sausages, 4 types of buns, 27+ flavors, 20+ signature sauces, appetizers, beers, drinks, unique company culture, healthy ingredients, and vegetarian options? Following our founder’s personal values and business philosophy, Umai Savory Hot Dogs™ is a great advocate of community building. We love to support our local markets with various community discounts, fund-raisers, charity events, and local school and church support events. That’s why our store locations are so loved by our customers and community. We are here to build a legacy with each new store opening - one that you will become a part of. We're unique and our fans love us for it. Superior product and service quality. We strive for all natural and health-focused products. Community support and charity programs. Flexible store formats to fit every neighborhood. 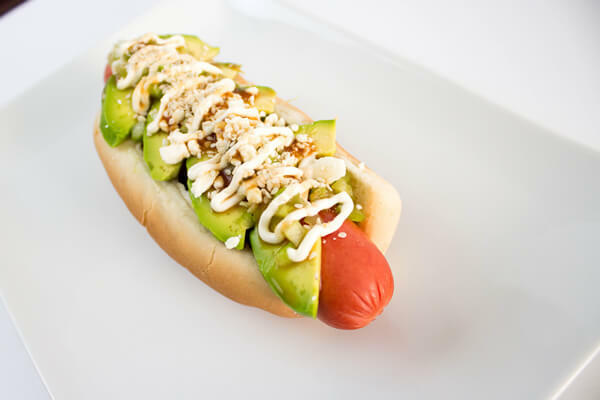 Do you like healthy, gourmet fusion hot dogs? Do you like to work with people and offer stellar customer service? Do you like to serve your community and give back? Are you ready to join one of the fastest growing restaurant concepts? If you answered yes, then it's time to be your own boss and join the Umai Savory Hot Dogs family. 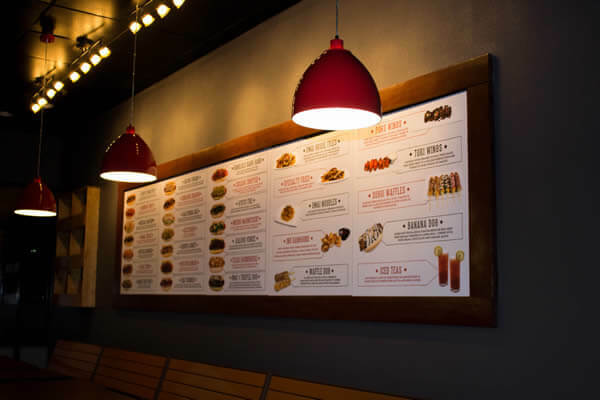 Let us help get your store open so you can share that same excitement, serving great, quality hot dogs with superior service and warm restaurant atmosphere. If you're ready, let us help you get started. If you like what you’ve read to this point and are interested in learning more, we’d love to answer your questions and give you details about this fantastic, ground-floor opportunity. To get started, fill out the form! We're ready when you are! Umai Savory Hot Dogs is currently accepting inquiries from the following states: Arizona, California, Texas, Utah, Washington.